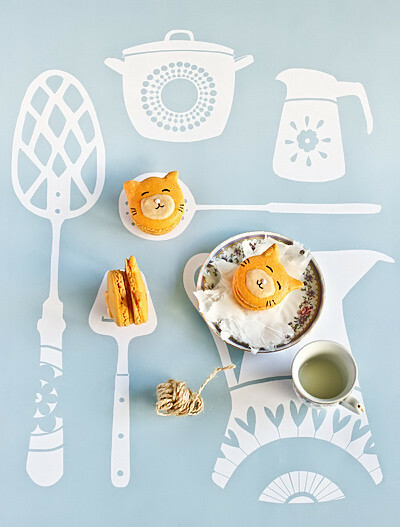 There have been a lot of animal-themed baked goods on this blog. 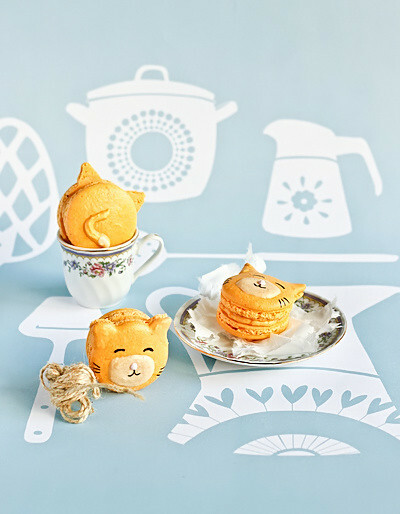 Pupcakes. Piggy Macs. Bunny Macs. 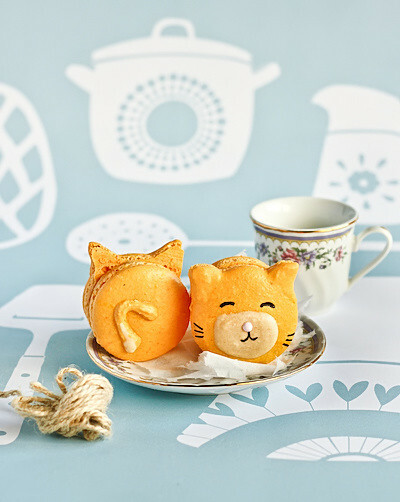 Sweets with little smiley faces on them are just too cute aren't they? This weekend is A's little sister's birthday and I wanted to make her something special. 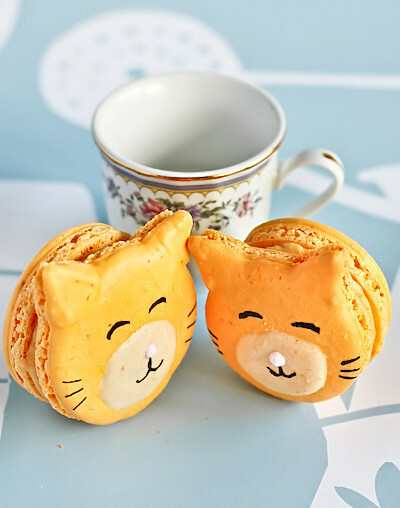 The newest member of their household is an adorable ginger kitty named Puss Puss and these kitty cat macarons are inspired by him. One thing we need to talk about is the filling. I decided to make a Carrot Cake-Flavoured Icing to match the orange shells. I was a little unsure if this would work but it turned out SO GOOD. 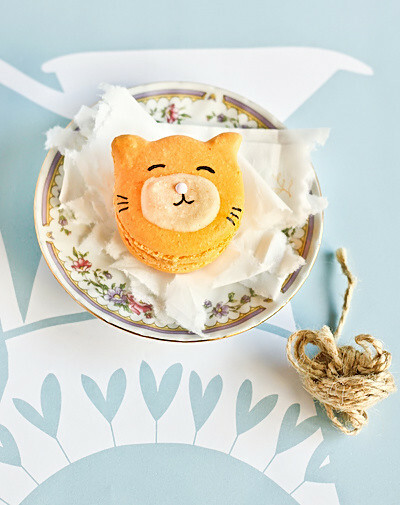 It tastes just like carrot cake with cream cheese icing. I'm quite chuffed with it to be honest. I did manage to dump an entire container of ground cinnamon on myself in the process, which was very messy and I kept smelling myself and getting hungry for the rest of the day. Hopefully A's sister will like these as much as I do. Happy Birthday Miss K! I ended up with two extra tail shells, which is super creepy and makes me think of that Halloween episode of the Simpsons which parodies The Fly and their cat and dog get spliced together...someone please tell me I'm not the only one who knows what I'm talking about. Add meringue to your dry mixture and mix, quickly at first to break down the bubbles in the egg white (you really want to beat all the large bubbles out of the mixture, be rough! ), then mix carefully as the dry mixture becomes incorporated and it starts to become shiny again. IMPORTANT: Just as the mixture has started to combine, place about 1/4 of the mixture in a separate bowl and set aside (to be used for the white part of the faces). Add orange food colouring to the remaining mixture and mix until the correct consistency. Take care not to overmix, the mixture should flow like lava and a streak of mixture spread over the surface of the rest of the mixture should disappear after about 30 seconds. 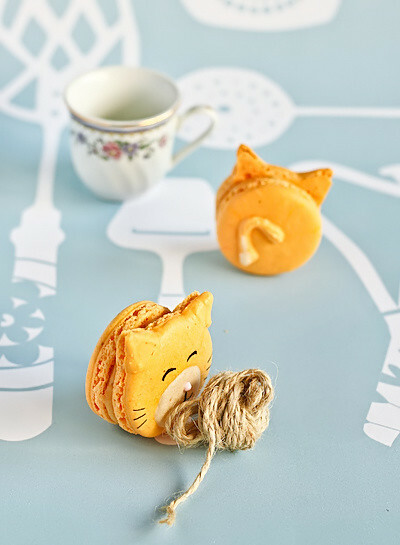 Place in a piping bag and pipe rounds of about 3-4cm diameter on baking sheets, about 10 on each sheet or silicon baking mats. Make sure you leave enough space above each round so you can pipe the two ears for each kitty face. Using a narrow piping tip, piped triangular ears on half of your piped rounds. Tap baking sheets carefully and firmly on the benchtop a couple times to remove any large bubbles. Leave to dry for about half an hour. 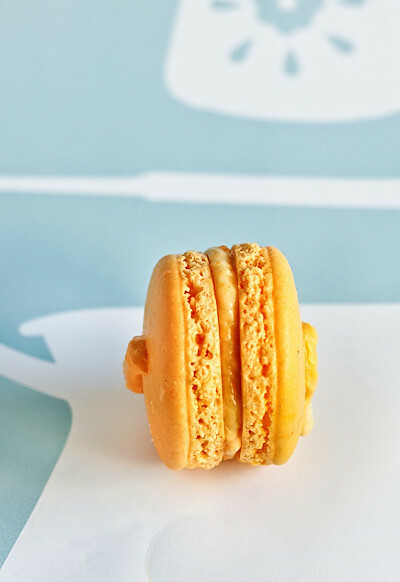 Mix the leftover white macaron mixture to the same consistency as the orange mixture and place in a piping bag. Pipe small circles over the top of the rounds with ears. Place a pink sugar ball/cachous in the middle of the white circle for the kitty's nose. If you still have some mixture leftover of either colour you can pipe small tails on the non-face shells. Leave this to dry again for at least half an hour, so that when you press the surface of one gently it does not break. This will help prevent any cracking and help the feet to form on the macs. Preheat your oven to 140-150 degrees C. Place on top of an overturned roasting tray or another baking sheet if your sheets are not professional grade, for better heat distribution. Bake for 15-18 minutes, depending on the size of your shells. Remove from the oven and cool on the tray for a few minutes, then gently remove from the sheet and place on a wire rack to cool completely. Use a skewer dipped in black food colouring or edible ink pens to draw on eyes (and whiskers if you choose). To prepare the carrot cake icing, heat a small non-stick frying pan on low and coat the surface with a small amount of unsalted butter. Place grated carrot in pan and sweat carrots until all excess moisture is remove and carrot is tender and cooked through (about 15 mins). Set aside to cool completely. Place cream cheese in a mixer (you may need to take it out of the fridge ahead of time to soften if you don't have a strong electric mixer), and beat until fluffy. Add sifted icing sugar, cinnamon and carrot and beat until smooth. Spoon/pipe onto shells and sandwich. Oh look it's another sponge cake. I'm a lost cause! 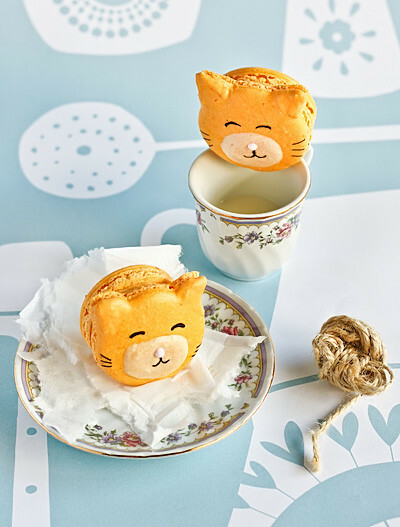 I don't want to make anything but sponge/chiffon cakes at the moment. You're just lucky that I stopped myself from adding malt to it, or I'd have to rename my blog Malty Spongecakes. Which somehow sounds kinda dirty even though it isn't. So I made another sponge cake. 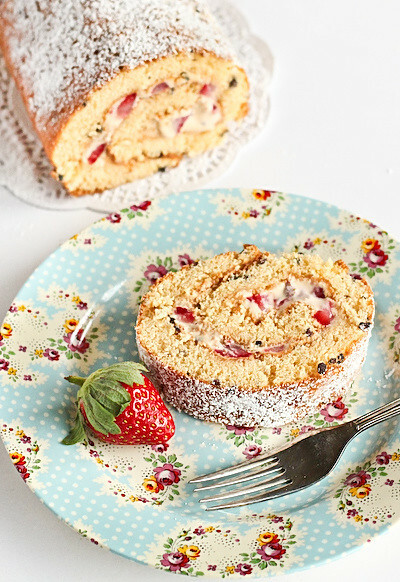 But this is the first time I've ever made a sponge roll! Plus I had all these lovely fresh small strawberries and lots of cream. And then I added cocoa nibs to the sponge. 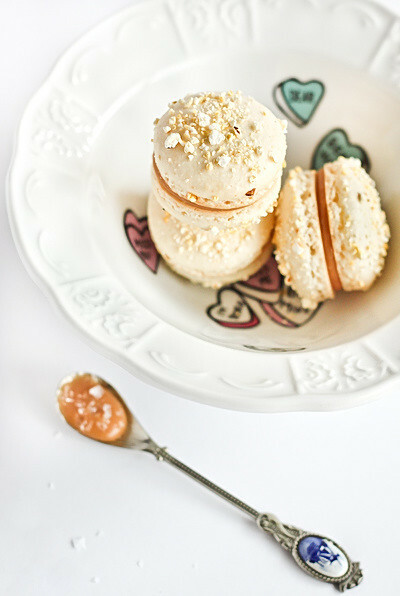 And dulce de leche to the cream. Ohhhh so good. 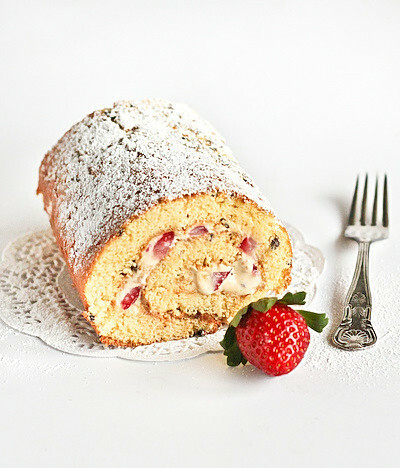 There was a total harmony between all the different textures and flavours in this cake. The small chunks of fresh tart strawberries are mixed in with this beautiful caramel cream to make the most delicious filling. 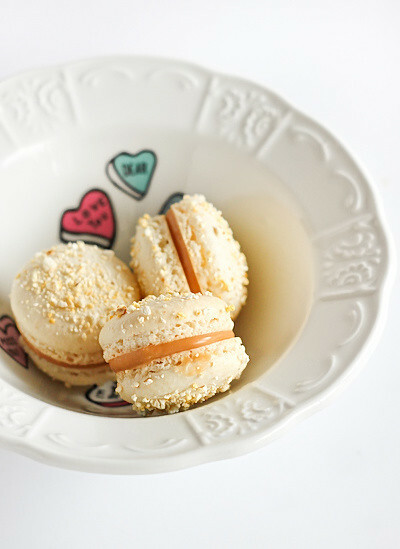 I love dulce de leche. I've never had an exploding can of condensed milk in all the times I've made it, so I am a firm believer in making it by boiling the whole can. Those of you who might have looked in my archives would know that I've already tried dulce de leche and cocoa nibs together with huge success (and now I really want to make these cookies again, they are ridiculously good). But who knew that mixing dulce de leche with some whipped cream would help mellow out the intense sweetness of the caramel, making you wish you could slurp it all up with a giant straw. 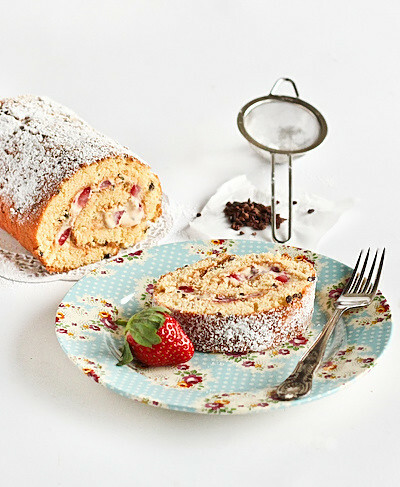 I made a simple vanilla sponge by adapting this tried and tested chocolate sponge roll recipe, the same one I used for my Tim Tam & Mint Slice cakes. I didn't have a proper Swiss roll pan, but I used a cookie sheet lined with baking paper and it worked perfectly. I did have some issues rolling up the thing, my caramel cream was super runny and I way overfilled my sponge roll, so it started oozing out everywhere (I've adjusted the recipe below with tips so hopefully it won't happen to you). But I'm so used to disasterous messes in my kitchen these days, so I just wrapped the whole thing up and stuck it in the freezer over night, scraped the excess filling into a bowl and ate it with a spoon for dessert ;) I highly recommend it. 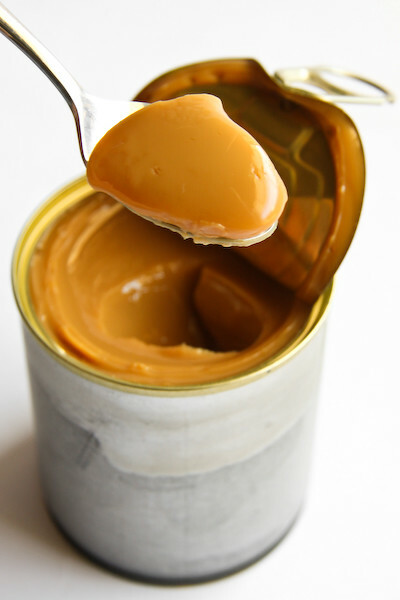 Prepare the dulce de leche ahead of time (see above for method), cool can under tap water and then measure 1 cup of dulce de leche into a medium bowl and whisk until smooth. Set aside to cool completely. Preheat oven to 180°C (350°F). Whisk eggs and sugar in an electric mixer until thick and pale (5-6 minutes). Add vanilla and sift over cornflour, flour, cream of tartar and bicarb soda, fold in with spatula. 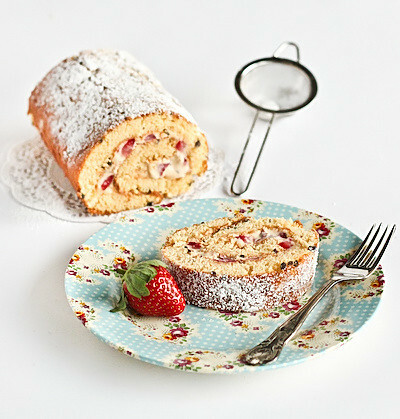 Fold in butter, spoon into a baking paper-lined 30cm x 42cm swiss roll tin (I used a medium cookie sheet), smoothing top. Sprinkle cocoa nibs over the surface of the batter. Bake in centre of oven until light golden and cake springs back when lightly pressed (10-12 minutes). 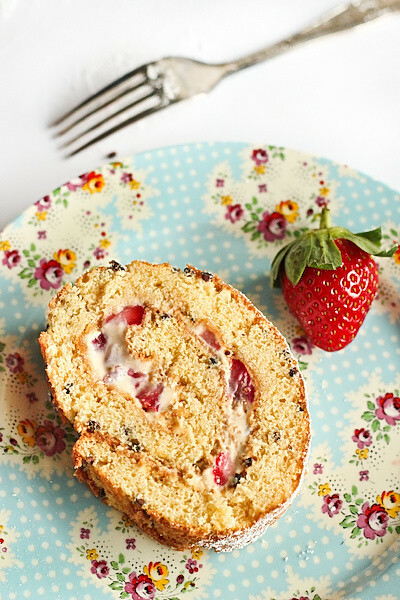 Turn onto a tea towel lined with baking paper. Peel paper from sponge and, with short side facing you, roll in tea towel to form a log. Stand until just cool (8-10 minutes). I'm alliiiiveee! Well sort of. It's been a very icky, snotty, exhausting week in bed. I managed to catch myself one nasty b*tch of a bug, one that was so bad that even A (who proudly boasts that he only gets sick once every 5 years) caught it too. So that meant that when I finally started feeling a bit better I forced myself out of bed to make him honey lemon drinks and huge pots of chicken soup. Other than that most of last week was spent in bed, watching Buffy and eating lots of comfort food. I may or may not have eaten an entire tray of Sara Lee chocolate cake (I know who to blame for my rekindled love of their frozen cakey goodness). But finally, after many Sudafed-induced sleeps I was better enough to get back into the kitchen to bake something. It's always a very obvious sign that I'm very sick if I don't even have the energy to bake, usually when I'm feeling a little under the weather I still manage to whip up some scones. So today I kept things pretty simple, I don't quite have the energy for one of my crazy baking experiments just yet. I just wanted a lovely sweet tea cake to nibble on. I love tea so effing much. Every kind of tea. Chinese teas, Japanese green tea, a milky English Breakfast, give it to me by the bucketload. But other than matcha flavoured desserts I haven't tried too many tea-flavoured desserts. Earl Grey seemed like the obvious choice to try out, with its distinctive bergamot aroma and flavour. 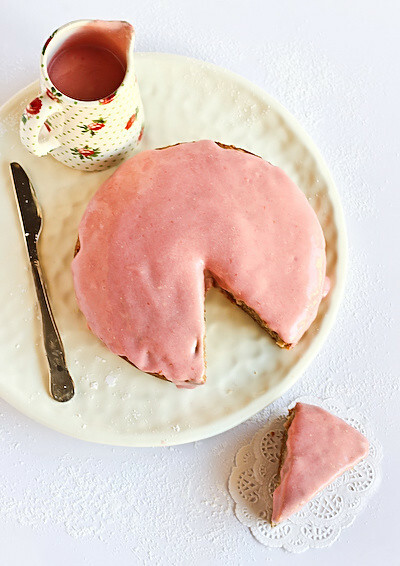 I had a bunch of rhubarb waiting to stewed and I always love the combination of rhubarb with any kind of citrusy flavour, so I decided to try an Earl Grey Tea Cake with a Rhubarb & Cream Cheese Icing. At first I was imagining swirls of lusciously thick cream cheese icing, but as I started making it I realised that a glaze would work much better. 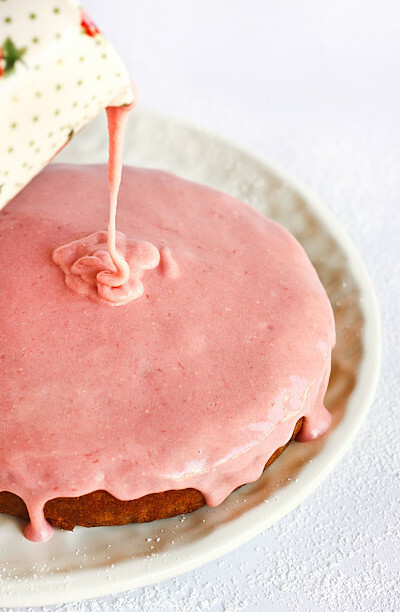 The icing was quite sweet so I didn't want too much of it on the cake, plus I had to use quite a high ratio of rhubarb puree so that it wouldn't be overpowered by the flavour of the cream cheese. 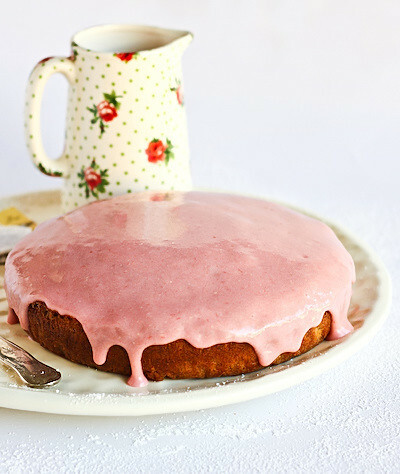 I love the light pink colour that the rhubarb gave the glaze, it just looks so inviting and fresh drizzled over the cake. The exterior look and feel of the cake itself is quite deceptive. It looks appears slightly dense and heavy, but when you cut yourself a slice you find a beautiful fluffy centre with just the right amount of flavour from the Earl Grey. It's not too strong but you can definitely notice its presence. 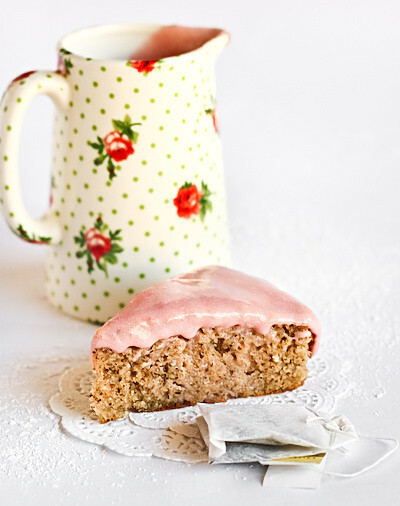 I actually quite like the mottled banana-bread-like appearance that the loose tea leaves give the cake. The first thing you taste is the sweet rhubarb mixed up with smooth cream cheese and just a hint of lemon zest, then you're left with the light aftertaste of the bergamot. 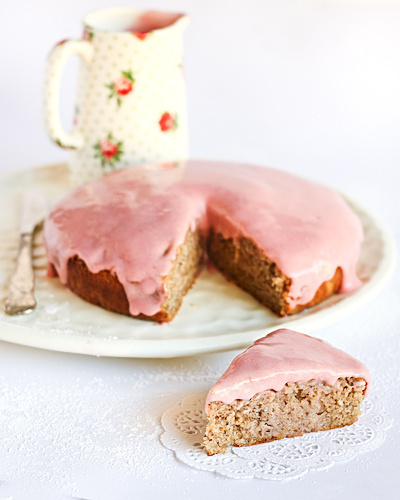 It's one of those lovely girly cakes that you just want to sit down and share with your girlfriends over a cup of tea. Preheat oven to 180°C (350°F). 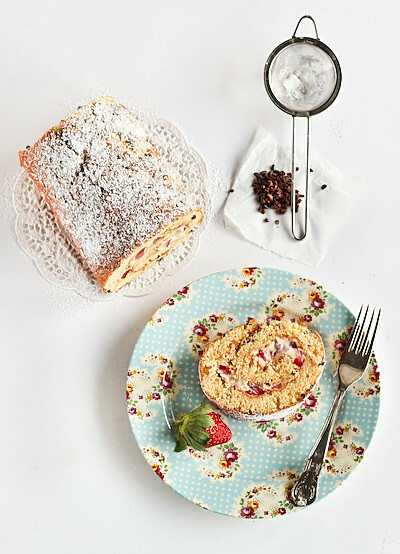 Grease and line a 20cm round cake tin. Empty the tea leaves from the tea bags into a cup and add the boiling water. Set aside for 3 minutes then add milk to cup. 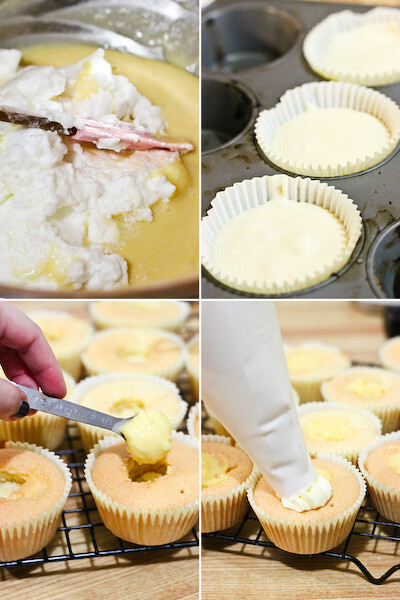 Place butter and sugar in a large mixing bowl and beat with an electric mixer on high speed until light and fluffy. Reduce speed to medium and add eggs one at a time, beating until smooth. With the mixer on low, gradually add flour and tea mixture, alternating between wet and dry ingredients. Beat until just combined. Pour mixture into prepared tin and bake for 25-30 minutes or until golden and a skewer inserted in the cake comes out clean. Remove from the oven and set aside for 2-3 minutes before turning onto a wire rack to cool completely. 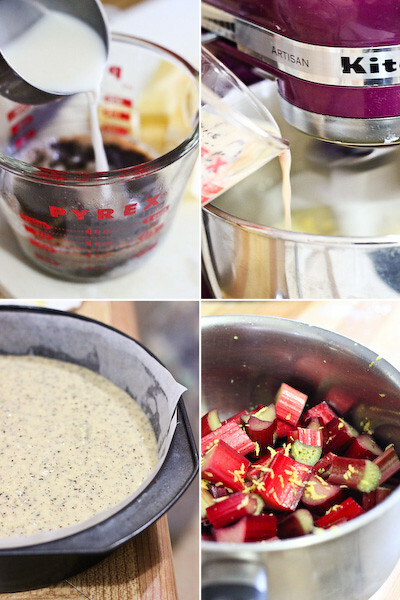 While the cake is baking and cooling, place rhubarb in a small saucepan on low heat with lemon zest, sugar and water. Stirring occasionally, simmer rhubarb until soft and cooked through, about 10 minutes. Remove from the heat and set aside to cool. Puree mixture in a food processor or blender. Place cream cheese in a large mixing bowl and beat until smooth. 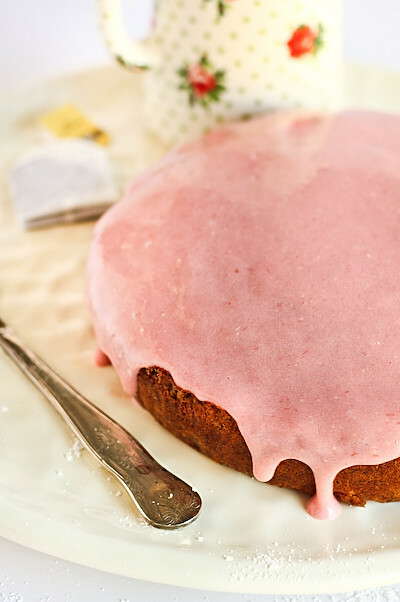 Add sifted icing sugar and rhubarb puree and beat until smooth. 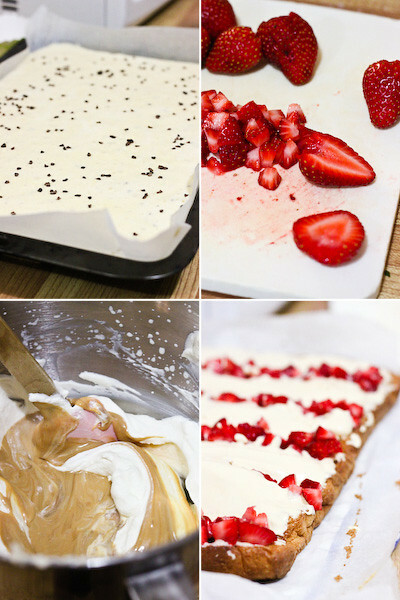 Pour over the top of cooled cake and serve immediately. Can be refrigerated overnight. Remember how I said I was suffering baker's block? One thing I tend to do when I'm lacking inspiration is look at what's left in my fridge and then browse my favourite recipe websites for ideas. And I have to say, it worked like a charm this time. 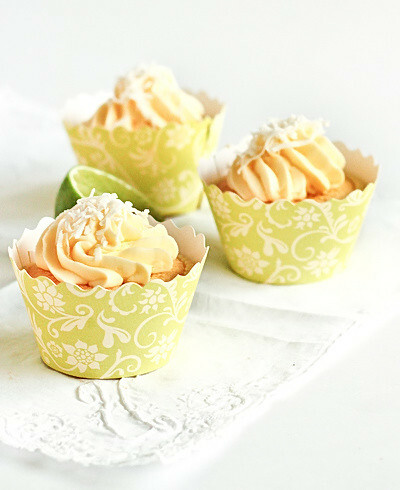 I may be completely short of ideas, but somehow I managed to whip up some amazing little coconut chiffon cakes with lime curd and coconut buttercream. Now that I've finally gotten over my fear of baking sponge and chiffon cakes, there's no turning back. I love how light, moist and versatile it is. 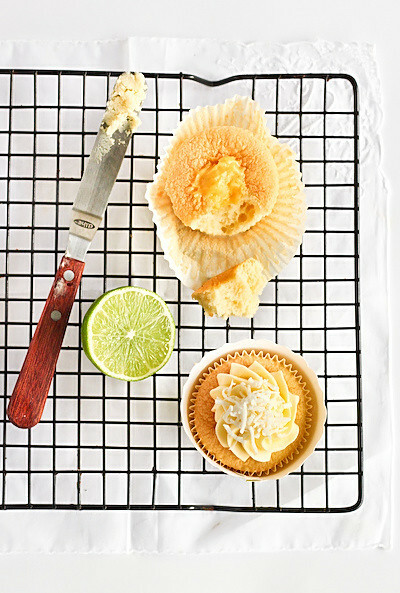 I've had this coconut chiffon cake recipe bookmarked for some time and I had all these limes waiting to be used (they were on special!). 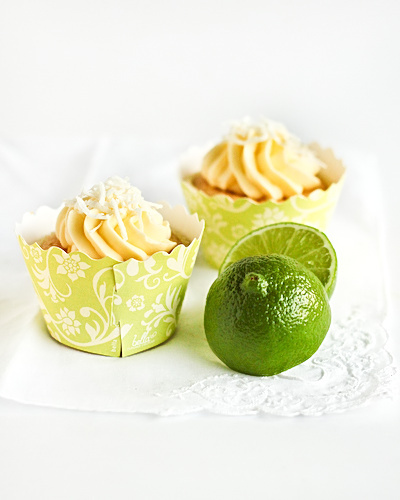 However instead of making a giant cake, I decided to make some petite cupcakes, filled in the centre with a dollop of that rich, creamy lime curd. 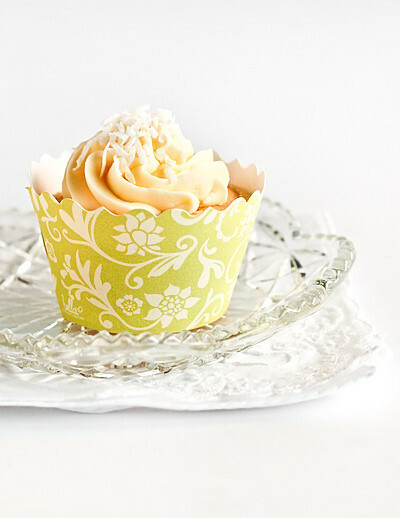 I then whipped up a lovely coconut Swiss meringue buttercream, a little different from the original recipe but it was just what the cupcakes needed. I was a little apprehensive at first as the recipe used a lot of coconut essence, which I tend to find has a very artificial, unpleasant aftertaste. But it turns out that there's just the right amount of it used in this recipe to give you the heady aroma of coconut as you bite into the cake. I love how reliable all the GT recipes are. 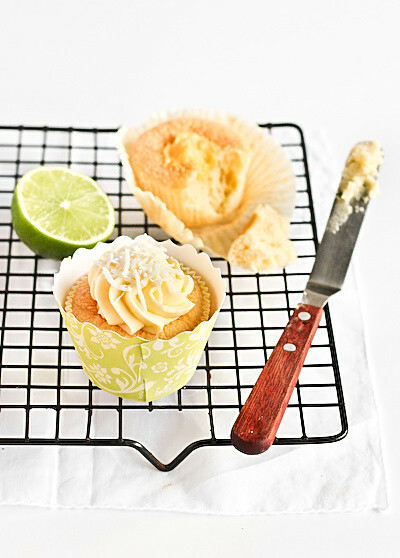 Lime and coconut are two things that are just meant to be together forever, and the lime curd is so rich and thick that you only need a tiny amount with these fluffy, super soft cakes to make them perfect. The only thing I wasn't sure about was whether or not to toast the flakes of coconut that went on top. In the end I went with untoasted because I love its snowflake-like appearance, but I can imagine the toasted coconut would have tasted great. 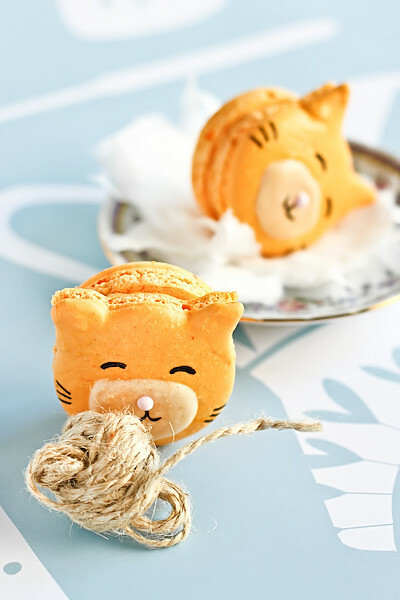 Please make these, they will make you (and the people you feed them to) extra happy. Prepare the lime curd first; whisk butter, sugar, lime juice and egg yolks in a heatproof bowl over a saucepan of simmering water until combined and smooth, then stir occasionally until thick (3-6 minutes), make sure to keep an eye on it so it doesn't get lumpy. Stir in lime rind and remove from heat. Squeeze excess water from gelatine, add to curd, stir to dissolve. Cover closely with plastic wrap, set aside to cool, refrigerate until set. Preheat oven to 165°C (330°F). Combine flour, sugar, baking powder and salt in a bowl. 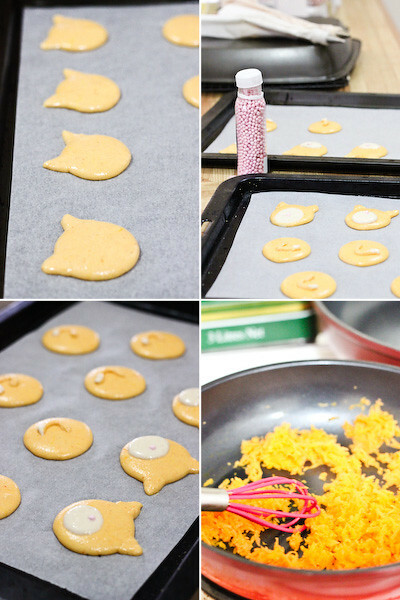 Whisk in water, vegetable oil, egg yolks and coconut essence until smooth. Whisk eggwhites and cream of tartar in a separate bowl until stiff peaks form, fold one-third through flour mixture, then fold remaining eggwhites into flour mixture. Pour equal amounts into a 12 hole (I ended up making 15 as my papers were small) cupcake or muffin tin lined with baking papers, then bake until cakes are golden and a skewer withdraws clean (18-20 minutes; don’t be concerned if cakes crack a little). Cool cakes gradually by first turning off the oven a couple of minutes before they are done, then remove them from the oven and cool in tin for 10 minutes, then remove and cool on a wire rack completely. Brush with Malibu (I didn't have Malibu so I skipped this step and added an extra 1/2 tsp of coconut essence to the cake batter) and use a spoon or a knife to scoop a small amount of cake from the centre of each. Fill each hole with lime curd, about 2 tsp each. Prepare the buttercream; place egg whites and sugar in a medium heatproof bowl and whisk together. Place over a small saucepan of simmering water, attach a sugar thermometer and continue to whisk until the mixture reaches 160 degrees F (70 degrees C). Remove from heat and transfer to a large mixing bowl and whisk with an electric mixer on high until cooled and thick, about 3 minutes. Continue whisking on high, adding a tablespoon of butter at a time until it is combined. Add coconut essence and whisk until combined. If the mixture is runny at this point, chill for about 5 minutes and then beat until stiff. 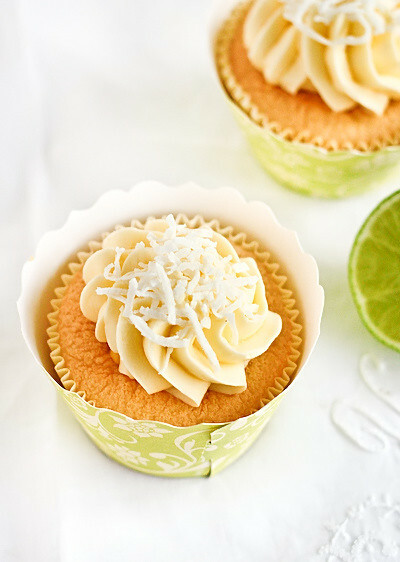 (The mixture may look like it has split, but keep whisking and it will come together eventually) Spread or pipe over cupcakes and sprinkle a pinch of coconut over the top of each. Can be stored in an airtight container for about 2 days.